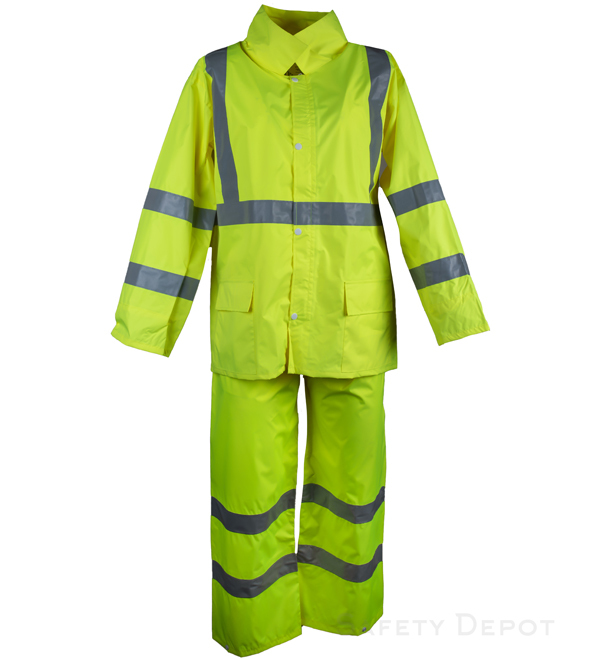 Need Class-3 protective rain gear, but want to keep cool and comfortable while wearing it? Try our NEW lightweight class 3 rain jacket and lightweight rain pants (sold separately). An alternative to traditional heavy, hot rubberized raingear, these lightweight rain gear separates will keep you visible, dry, cool, and comfortable while performing the demands of any outdoor job under the most extreme rainy weather conditions. Our lightweight rain jackets have ventilated armpits, big front flap pockets to hold necessities, detachable hoods that can also roll-up into the collar, and ample reflective striping for the best visibility during low-visibility weather. Additional rain gear and rain jackets available. From Anonymous of Danbury, Connecticut on 11/20/2017 . I needed a safety jacket for walking my dog at night. Some of the streets we walk are poorly lit and the cars come zooming by. This works perfectly - I can wear it over winter clothes if I need to and hood is perfect for rain. The pockets are big and useful.